This week’s influenza (flu) data from Queensland’s Department of Health suggest that the virus is toying with Queenslanders – and much of Australia – this season. The total number of confirmed flu cases this week is below those for each of the past 3 weeks. Next week is a new week though and flu numbers might jump. There is nothing we can really predict from this. Now that the formerly exhausted vaccine stocks have returned to the shelves,[1,6] it’s a great time to get a vaccination against flu disease. That is if you aren’t one of the many who can and have already done this pretty smart thing. Figure 1. 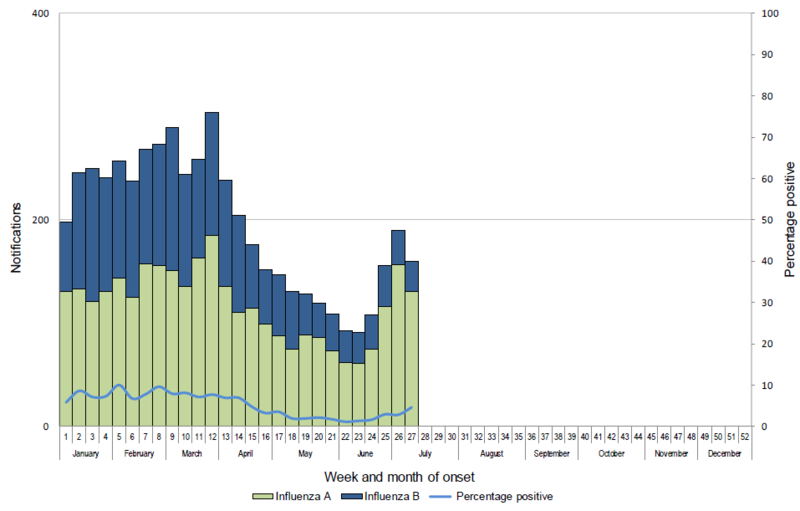 Laboratory-confirmed influenza data to 15JUL2018. Data compiled, graphed and published by Queensland Health, The State of Queensland, Australia. Figure 2. 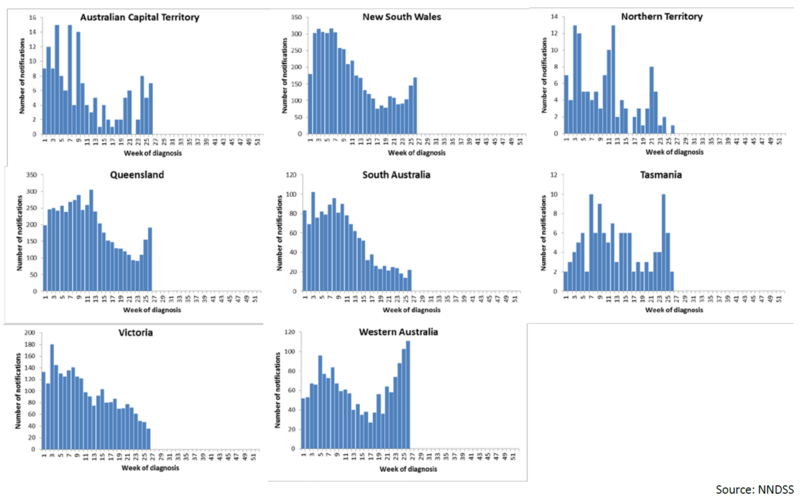 The number of influenza notifications (laboratory-confirmed cases), Australia, 25-years. Data from NNDSS. Click to enlarge. Although, if we look a bit more closely at the national data States-by-State (Figure 3; ) we can see how varied the occurrence of flu cases can be in this wide brown land. The west coast has gone flu mad while the east is generally still thinking about it. Up north is quiet and down south is quite to all over the place (Tasmania). Figure 3. 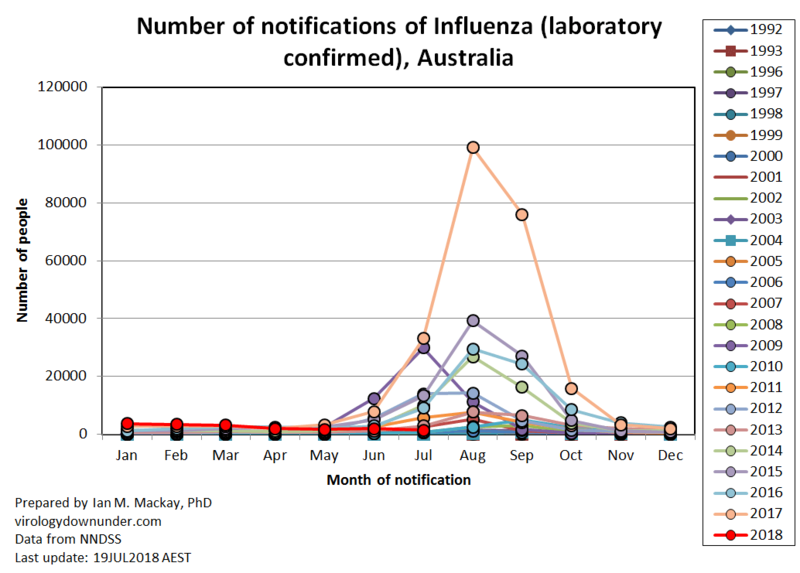 The number of influenza notifications (laboratory-confirmed cases), State-by-State, Australia, Week 1 to Week 26, 2018. Data from NNDSS. Click to enlarge.